The Century Plant (Agave) is a striking xerophyte with a unique shape and spikey foliage. While resembling the aloe plant, the sharp spiny teeth of the agave are its distinguishing feature. Another difference between the two plants is the aloe is a succulent (a thick and fleshy plant whose foliage and stem retains water) and the agave is a xerophyte (a plant that requires little water). Native to Mexico, Arizona and Texas, the Century Plant has adapted to living in an environment with little water. 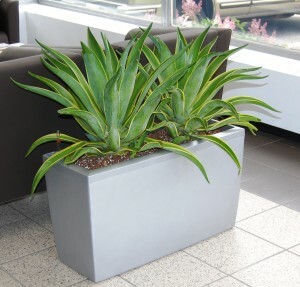 The agave is a slow growing plant that thrives in bright light all day, all year round. When kept indoors, this plant should be potted in a container with excellent drainage to avoid over watering. Remember, its natural environment has little water available! Use a soil-based mix with perlite and keep it just moist in the growing season (summer) and allow soil to dry out in the dormant season (winter). When the weather gets warm,this plant loves to be outside. Again bright, full light is ideal. While striking and a great addition to a collection of plants at home, this plant is not too often used as a tropical office plant. It’s demanding light requirements limit the spaces it will suit, and the spikey foliage even more. Spines also emerge from the center of the plant with new growth. These spines/spikes are very hard, sharp and have potential to harm someone passing by. When using the aloe as a tropical office plant a regular part of maintenance is pruning these spikes as soon as they emerge to avoid accidental injury. While not requiring much water, this plant still requires all other aspects of regular maintenance -pruning, cleaning and fertilizing. Not enough light for an Agave? Consider an artificial one. Amazing replicas of Agave and succulents are available and are incredibly life-like.